Robot Mode: Brawl in robot mode looks totally awesome and extermely powerful. An armed and armoured behemoth set to blast everything into smithereens and just stomp over whatever survives. His military green colours, his bulkiness, and the vast amount of weapons on his person just enhance that image. That said, I do have one major complaint about this figure. 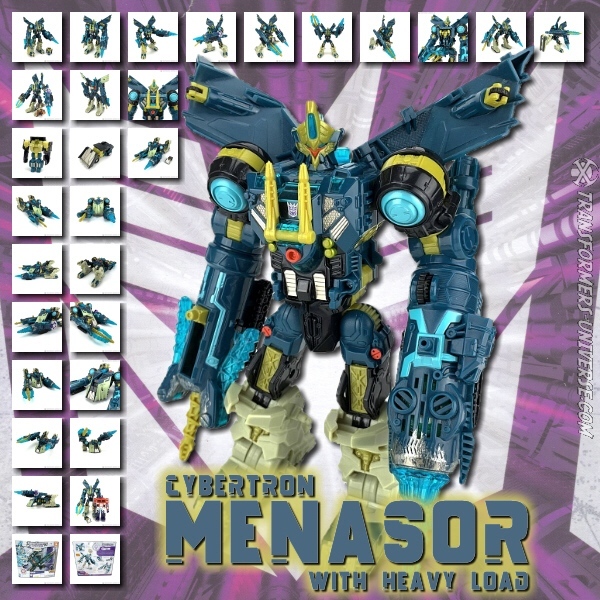 He is plagued by much the same design problem we've seen in Cybertron Skywarp, that being that his arms, which fold out from the tank turret on his back, are connected to his torso by just a tiny little plastic knob. It holds if you push it in, but moving the arms in any way causes it to pop back out unless you're very, very careful. Brawl's general posability is pretty good, but the arm problem restricts him anyway. So bottom line, a robot that looks awesome, but has some problems that effect his play value. Vehicle Mode: The Transformers Movie sets a darker tone than many of the more recent Transformers series and Brawl is a good example of that. His alternate mode is a tank and, unlike the tank modes of some recent figures I can think of, it looks like a realistic tank, too. Dark green, armed with big and small guns, and no flashy colours anywhere. The turret can rotate a full 360 degrees, so can the smaller turret on top of the bigger one, and the small machine guns on the sides are on balljoints, so their range of motions is impressive as well. All in all, a pretty good vehicle mode. Remarks: Named after the G1 Decepticon warrior that comprised one fifth of the Combaticons, Brawl is a pretty good-looking figure that epitomizes the Decepticon philosophy. He's built for war and it shows. I would have given this figure an A for its good looks and very nice alt mode, but the design problems with his arms drag him down quite a bit. It really bugs me because I think it wouldn't have been all that difficult to put in something better than those tiny little knobs. So Brawl gets only a good average. Great for looking at, not so good for playing with. --Review--Robot Mode: A huge robot, bristling with weaponry, is standing here in front of me. His grim look easily reveals his determination to destroy everything and fills the room. Brawl's robot mode is very impressive. Double blades, the big cannon of his tank mode sits on his right arm, Megatron-style, and two rocket launchers are mounted above his shoulders. Brawl is built for battle und looks the part. Look-wise he is very impressive und is the very model of the merciless Decepticon warrior. Added to that is his superb posability. He is also nicely balanced, arms and legs are as posable as one can expect, and he can pull off dynamic poses without problems. It's lots of fun to make him come alive. But there's that problem with the arms... At first I thought it wasn't so bad. If you pushed those plugs in tight enough they'll hold. At least at first. By now, though, I have the feeling they don't hold at all anymore, getting worse each time I transform him. Which is sad. A brilliant figure is pulled down quite a bit by such a minor flaw. I use my figures mostly for stop motion clips and it bothers me a lot if my figures fall apart there. So some points deducted for that. Apart from that, though, an excellent robot mode. Vehicle Mode: The tank looks pretty wholesome. The camouflage pattern is nicely painted and the turret can turn in all directions (even though that results mostly from the transformation). There isn't really a lot you can say about this mode. It's a tank. The only thing that loses him some points is that you can see Brawl's head underneath the main cannon. Could be hidden better and it wouldn't have taken much, I think. Transformation: The transformation is relatively simple. There's no fear of breaking something and the parts fit together well. Except for the shoulders, of course. So no complaints. Remarks: Unfortunately I waited a long time before I decided to get Brawl for my collection. Leader Brawl was a bit too big for my taste (and too expensive), so I decided on the Deluxe version. That one I had to import from the US at some cost, seeing as I couldn't find it here anymore. Brawl has been with me for some time now and has already starred in some of my stop motion clips. All in all I'm satisfied with him. Only the thing with the arms takes some getting used to. You need to keep it in mind. But I still love this little monster. Now if one were to mathematically put the three ratings together he'd get a solid B, but I'm deducting half a point, seeing as the Hasbro people could easily have avoided the thing with the arms, I think.